An essential requirement in any fluid system is the ability to isolate. The reasons are many, they could be to shut down the system, or to install/remove equipment, divert the flow allow access or for routine maintenance. 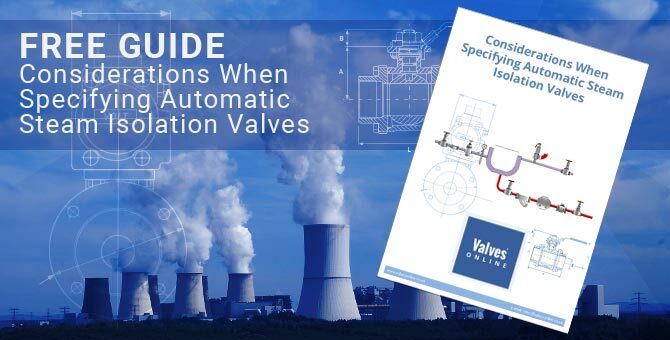 When you are selecting an isolation valve from Steam Select / Valves Online, you can be sure that quality, performance and safety, are our main priority. We are dedicated in helping you achieve the correct valve enabling process efficiency, energy savings and increased production that complies to ever changing legislation. Steam Select / Valves Online are able to do this through our increasing partnerships with world leading manufacturers who have extensive knowledge in process and system solutions. We know that every process is different and requires its own special needs which is the reason why Steam Select / Valves Online offer selections of isolation valves to fit your requirements giving you a comprehensive range of designs, in various materials and sizes to help you achieve your solution. Our staff have expertise in steam systems and for other process related fluids, we are here to help and advise to help.